The best book on the Battle of the Crater, period. Hess uses the most sources, uses them well, and doesn’t take anything for granted. He debunks some “facts” as myths and only further reinforces others. 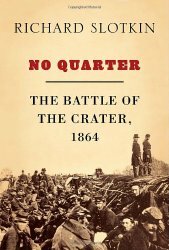 In addition, Hess does a good job of placing the Battle of the Crater in the wider context of Grant’s Third Offensive and the entire Siege of Petersburg. Many excellent maps are tied well to the text. This book is worth the cover price for the extensive bibliography alone. 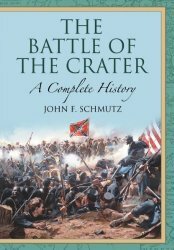 If Earl J. Hess’ Crater book is the best on the Crater, Schmutz comes in a close second, and is probably the best when you consider strictly military history. Schmutz, like Hess, utilizes a wide variety of sources. The author also covers the First Battle of Deep Bottom early in the book, an added bonus. The price for the hardcover at this point in 2014 is a ridiculous $230 due to unscrupulous third party sellers, but the paperback is still at a reasonable price. Two of the author’s ancestors were involved on the Union side, including one who was a member of the 14th New York Heavy Artillery, the first regiment to reach the Crater. The focus of Levin’s book is different. Rather than going into a lot of detail about the military aspects of the battle, the book looks at how competing groups fought to have the Battle of the Crater remembered during Reconstruction and beyond. This is a good companion to any of the books which are strictly military histories of the Battle of the Crater. Schmutz and Levin make a nice pair if you’re in the market for multiple books on the Crater. Axelrod’s book is written for the general, non-ACW buff reader, and he mostly succeeds in that mission, pun definitely intended. If you check the notes, you’ll see tons of “Ibid.”‘s occurring, and they mostly refer back to the Official Records. I found it a little odd that Axelrod utilized the ORs so heavily in what was meant to be a popular history of the Battle of the Crater. Still, if you are going to utilize mostly one source, the ORs are the one to go with. I’d recommend this book for those of you wanting to get more familiar with the battle without having to delve into the tactical minutiae of which I’m such a fan. It’s a better intro, in my opinion, than the Cavanaugh/Marvel H. E. Howard volume orJohn Cannan’s book on the subject. Now, after a multitude of good books on the Crater have come out in the last seven years or so, I would rank this one at best sixth on the list. It’s still a good introduction to the Crater and is not a bad book by any means. It’s just that more recent scholarship has allowed other authors to surpass this effort, especially in regards to the issue of race, massacre, and memory. This is a book from the “Battleground America Guides” series aimed at newcomers to the battle. All in all I thought Cannan’s book was a decent one, though I do have some complaints. Let’s start off with the glaring error on the cover. It shows “June 30, 1864″ rather than the correct date of July 30, 1864. The maps were all brigade level, and no indication was ever given as to which brigades belonged to which divisions and corps. There is no order of battle either, and both of these things combine to make it more difficult for someone new to this fight. Also, as this book is in a standard series, it did not seem like Cannan was given much leeway as far as coming up with new ideas and interpretations of the battle, which is a shame in my opinion. The book contained 167 pages, and aside from a three-page index, everything else was text. There were no footnotes. This is a definite flaw, and reduces the value of a book tremendously. Petersburg National Battlefield Park Ranger Emmanuel Dabney, who also maintains a blog called Interpretive Challenges, pens the main article in this edition of Blue and Gray Magazine. This was an inspired choice by Editor Dave Roth, with the issue arriving less than a month before the 150th anniversary of the battle. Wiley Seord’s Letters series features a letter which focuses on the First Battle of Deep Bottom, and is penned by Grant staffer Frank M. Kelley. A series of six maps shows the main battle area, and Dave Roth shares the driving tour duties with Chief of Interpretation at Petersburg National Battlefield Chris Bryce.